Bus from Alor Setar to Singapore is the one of the important bus service for resident in Alor Setar who working or studying in Singapore. Even with the stiff competition from budget airline, bus remain as the passengers' preferred choice. 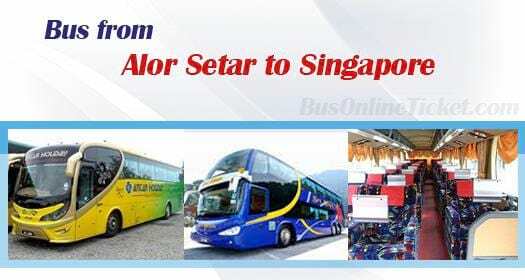 Why Taking Bus from Alor Setar to Singapore? First, there is no direct train service from Alor Setar to Singapore. Passengers require multiple transit along the journey before reaching Singapore Woodlands. Second, flight ticket fare for budget and commercial airline from Alor Setar to Singapore is usually 2 times or 3 times more expensive than bus ticket fare, unless you manage to book your flight ticket during limited promotion period. Therefore, bus is still the best option of transportation to Singapore from Alor Setar. Antar Holiday Express and Sri Maju are two reputed bus operator serving bus from Alor Setar to Singapore. Each of the bus operators having 2 daily departure, with 1 in the morning and the other in the evening. By comparing with flight ticket, bus ticket is always much economical. The bus fare from Alor Setar to Singapore is reasonably charged at RM 80.00. Duration required for bus from Alor Setar to Singapore takes about 12 hours depending on the road traffic and climate condition on travelling day. The boarding point in Alor Setar is located at Alor Setar Bus Terminal. The arrival point is located conveniently at Golden Mile Complex. Two washroom break will be given during the journey. Additional washroom break will be given upon request from the driver. Bus schedule from Alor Setar to Singapore is limited, passengers are advised to book bus ticket from Alor Setar to Singapore in advance via online ticketing portal BusOnlineTicket.com due to limited daily trips. Instant confirmation of booking upon payment.